A playscape is a play space that looks and feels like a natural environment with as little man made components as possible. Playscapes offer a wide range of open-ended play options that allow children to be creative and use their imagination. A natural playscape is an outdoor play environment that engages children with nature, provides opportunities for creative, open-ended play, exploration and healthy development. The playscapes are built by community volunteers utilizing the skills of local artists and artisans with materials from the local natural environment. Playscapes are Natural Playgrounds. 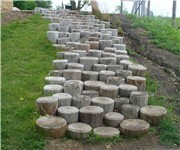 They are designed with the intent to bring children back to nature using: fallen logs, tree stumps for seating, vertical logs for forts, slides embedded in the side of hills etc... Playscapes and Natural Playgrounds offer a wide range of open ended play options for children while remaining safe. On the other hand, standard play structures or playgrounds are commonly associated with children's area's occupied by a play structure. Structures offer very little in terms of imaginative, open-ended play. Play structures are a way of prescribing and standardizing play for children. Jester Park Natural Playscape in Iowa - The Natural Playscape is not a run of the mill playground. It is a play area constructed using natural materials such as boulders, earth mounds & water features avoiding plastics, metals, concrete, lumber, or signs explaining how to play. Children that roll down hills, scramble up rocks, dam up water, or hide in grass experience natural play. This type of play frees the child’s imagination to limitless learning opportunities. Creative Playscape in Georgetown, TX - Is it an Old West fort, a castle or a log-cabin village? The Creative Playscape in Georgetown — with lookout towers and a maze of bridges and walkways — is anything your kids want it to be. The fenced-in playscape in San Gabriel Park is an empire built of wood, a novelty these days, capturing my kids' attention as we arrived one recent Sunday. The place was an island of activity, as children climbed under and around, over and up. So much to do, from the tire swing to the chimes (which still ring). Children could easily burrow into nooks and crannies for hide and seek, and the pathways are so numerous that at least one confused parent — me — couldn't figure out how to get from one play area to another without hopping over a low railing. A lot of built-in benches provided resting spots (no need to wait for another parent to get up before you can sit). The Creative Playscape was built in November 1993 by volunteer citizens for the children of Georgetown. The playscape is a Leather’s Design from Ithaca, New York. It is located adjacent to the Recreation Center at 1003 N. Austin Avenue in San Gabriel Park. Amenities include picnic tables, restrooms and benches. The Creative Playscape is a favorite place for birthday parties and school field trips. Queeny Park Playscape in St. Louis County - Queeny Park a nice large playground/playscape with unique pyramids built of cobblestones, including large concrete tubes tunnelling through. The park blends into the environment and is a great places for kids ages 5 to 10 to enjoy a few hours of more creative play. The Natural Playscape is comprised of a number of unique sections that each take advantage of their environments; Tall Grass Tangle, Stone Henge, Forest of the Dead, Bison Bluff, Log Stairs, and Boulder Scramble, Archeological Dig, Pine Grove and Lost Bridge, Wetland, Bubbling Rock, Waterfall and Petroglyph Carvings. Children's Park in San Marcos, TX - It is an array of multiple play structures with climbing ladders, slides, walkways, and swings that would brighten any child’s eyes just to see. This Playscape is one of the largest of its kind in the nation. It was proposed by a group of local mothers. The outter walkway around the park is the most unique design of individual blocks designed by local children with handprints and drawings in the concrete. Adventure Playground in Berkeley, CA - When your kids want to pound nails and splash paint, take them to Adventure Playground for a day full of banging, sawing, and building fun. Scrap lumber, rusty nails, 8-year-old architects, and bring your own hammer! Children can use their imagination, but parents must sign a waiver and accompany their children inside the fenced area. Donations of building materials are accepted. Come climb on the many unusual kid designed and built forts, boats, and towers. Ride the zip line or hammer, saw, and paint. 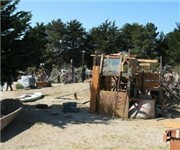 Around the fenced-in yard are towers, shanties, sheds, and buildings of every description built by young visitors. Children and adults may check out hammers and nails, hand saws, or paints and brushes with which to create their visions in plywood and board. Start your own project, or add onto the conglomerations begun by earlier carpenters.